A Herniated Cervical Disc is a painful condition where one of the discs (in the neck area) pinches on a nerve – causing painful symptoms. In this article we’ll discuss this condition and give you specific exercises that you can do at home to alleviate your pain. 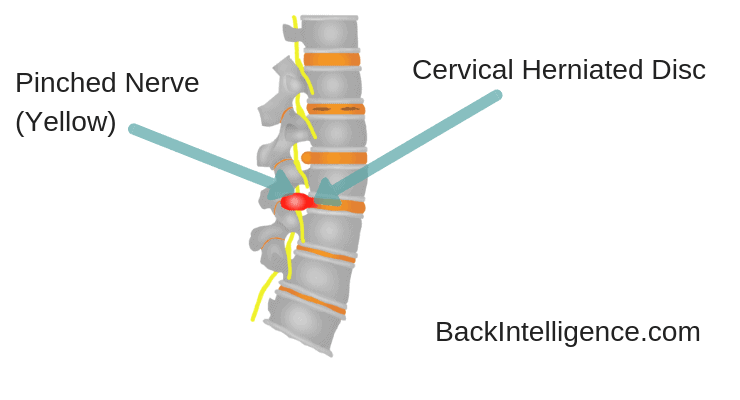 So, What Is a Cervical Herniated Disc? A herniated cervical disc is when one of the neck discs’ inner material (aka nucleus pulposus) protrudes or spills on/out the disc’s protective layer (aka annulus fibrosus) and pinches on the nerves in the neck – This causes painful symptoms. Neck pain or stiffness. This will typically result in an inability for the patient to move his or her neck in one motion or the other such as turning the head, side bending, or extension/flexion. Radiating pain down the arm/s, hand, shoulder, shoulder blade, chest. Sensory changes including burning, tingling, numbness, pins or needles. Muscle Weakness or Paralysis – If the protruding disc progresses and applies enough pressure, it can lead to severe weakening of muscles or inability to use the muscles properly. Poor Posture/Posture Dysfunctions – Usually this means Kyphosis posture which is defined by rounded shoulders and a forward head position – aka text neck. Trauma – This can occur when a person sustains a high impact force to the spine. Activities typically include: contact sports, work injuries, and repetitive trauma. This high impact for can cause a “rip” or “tear” in the outer fibers of the disc that can cause a sudden herniation. Our mission here at Back Intelligence is to provide you with natural treatment options, besides surgery (which should be the last resort). Manual therapy Spinal manipulation, mobilisation, and massage. Exercise therapy exercise therapy is generally the first line approach and generally provides good results with minimal investment (See exercises below). Traction – This can decompress the spine and can provide relief. Ice Therapy/Heat Therapy. Usually in the beginning ice therapy is recommended to reduce inflammation. 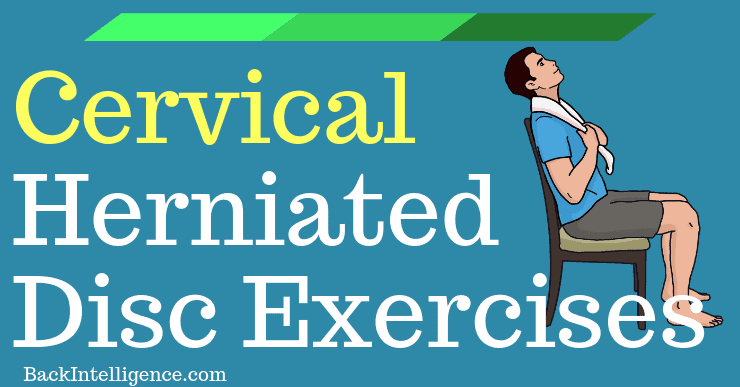 In this article we’ll focus on some of the exercises and stretches you can do at home. Please be careful, if any of these cause more pain, stop, and try a different exercise/approach. The goal with all of these exercises is to cause “centralization” of the symptoms. 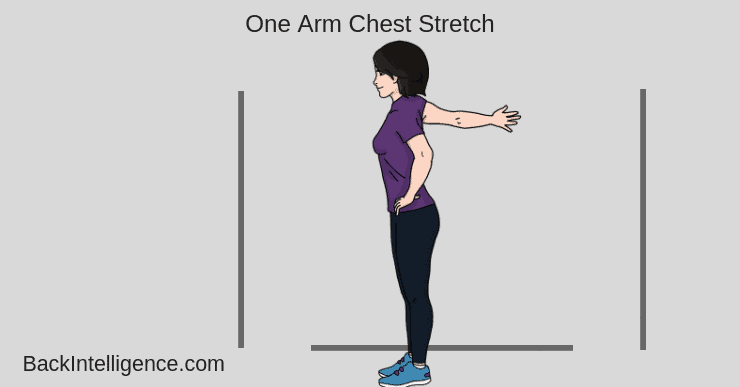 This means that when you do any of these exercises – you want your symptoms to come back/feel closer to the spine (center), rather in than in your shoulder/arm/hand. This will signal that it may be working for you. This exercise will help to improve the strength of the deep neck flexors (front of the neck muscles), helping to reduce forward head and rounded shoulders posture (Upper Crossed Syndrome). – Sit or stand with a good posture. – Retract the neck back and retract the chin at the same time. 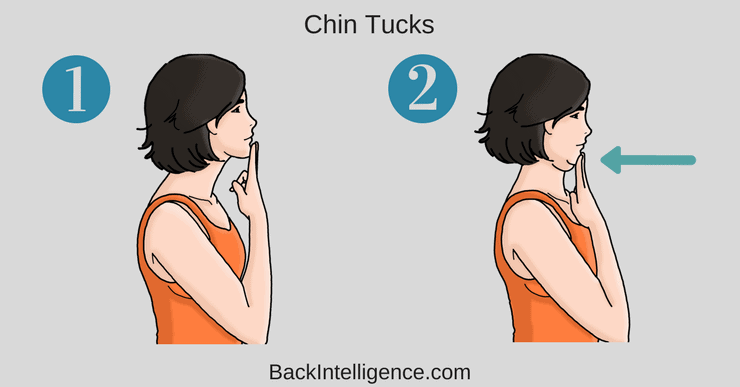 – Hold the chin tuck for 2-3 seconds. – Release the neck forward. This stretch can release some of the pain symptoms and push the disc material back into place. If this stretch causes more pain, move on to the next one. – Now stretch your spine up and over the back of your chair. 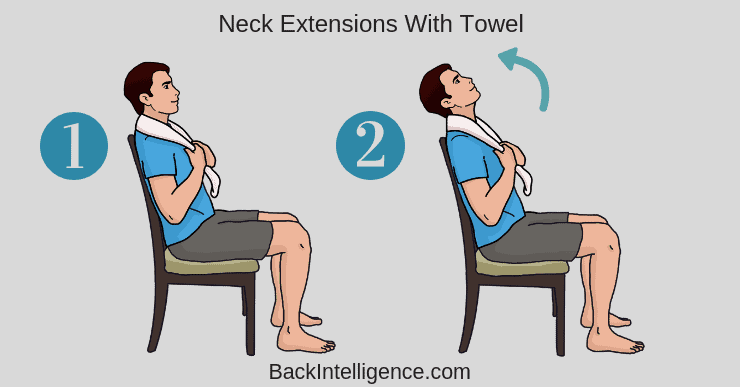 – Keep tension in the towel, to support your neck. This will stretch out the chest area which can be tight and pull the neck into a bad posture. Releasing the pecs will allow you to be in a better posture and can alleviate some of the pain. – Come close to a wall and stretch one arm behind you with the palm on the wall. – Now lean forward and slightly away from the extended arm. – Feel the stretch in your chest area. – Hold for 30 seconds. * Make sure you’re not just stretching you shoulder, but also the chest. Tweak the angle of your position to get the chest muscles. * If you feel any pain, stop this exercise and try another one. This stretch can help alleviate some of the symptoms, as well as, add some mobility to your neck. – Start either in a standing or seated position. – Place one of your hands on the opposite side of your head. – Now bring the head down towards your ear. – Use the hand overhead to press your neck down – to get a deeper stretch (Not too hard). – Hold for 30 seconds and do 2-3 sets. This exercise is meant to stabilize and strengthen the muscles in the mid-back which will allow your posture to improve. 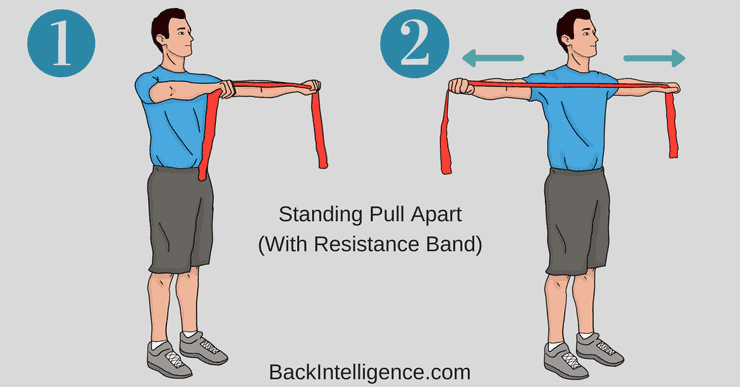 Holding a resistance band (level of resistance you use depends on your individual strength level) with both hands, straighten your elbows and bring your arms out in front of you. While keeping your elbows locked, slowly move your arms out and back behind your body. You should feel the muscles between your shoulder blades contracting/squeezing. Only go out as far as comfortable. Some muscular discomfort (burning) is ok, but pain in the arms or neck is not. Avoid shrugging your shoulders toward your ears. Repeat 2×10, gradually increasing to 3×10. By the time you get to repetition number 8, 9, 10, this should be challenging. If it is not, increase the level of resistance on the band. This can decompress the Vertebrae in your neck and spine, providing relief. The evidence for traction is mixed, but there seems to be some evidence supporting this method. 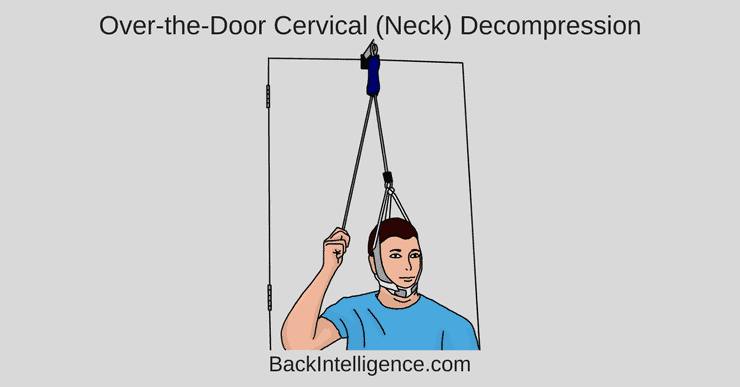 – You can use a device that is hung over a door to apply decompressive force to the neck. – Typically the device will also have strap to hold onto which allows you to control how much force is applied. If you don’t fix your upper back posture and daily habits, you condition may not improve, and could even get worse. Check out this article to learn the 10 steps to a proper sitting posture. Correct your Posture and Ergonomics, Ease Back & Neck pain and Increase your mobility. – Herniated disc. American Association of Neurological Surgeons. http://www.aans.org/patient%20information/conditions%20and%20treatments/herniated%20disc.aspx. Accessed July 19, 2016. – Mumenthaler, M, and Mattle, H. (2004) Neurology. 4th Edition. Stuttgart: Thieme. 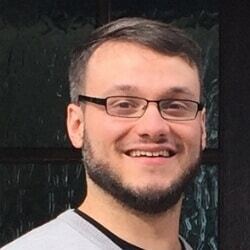 Michael is UK registered chiropractor who holds a masters in chiropractic. He has worked with with patients, athletes and celebrities. 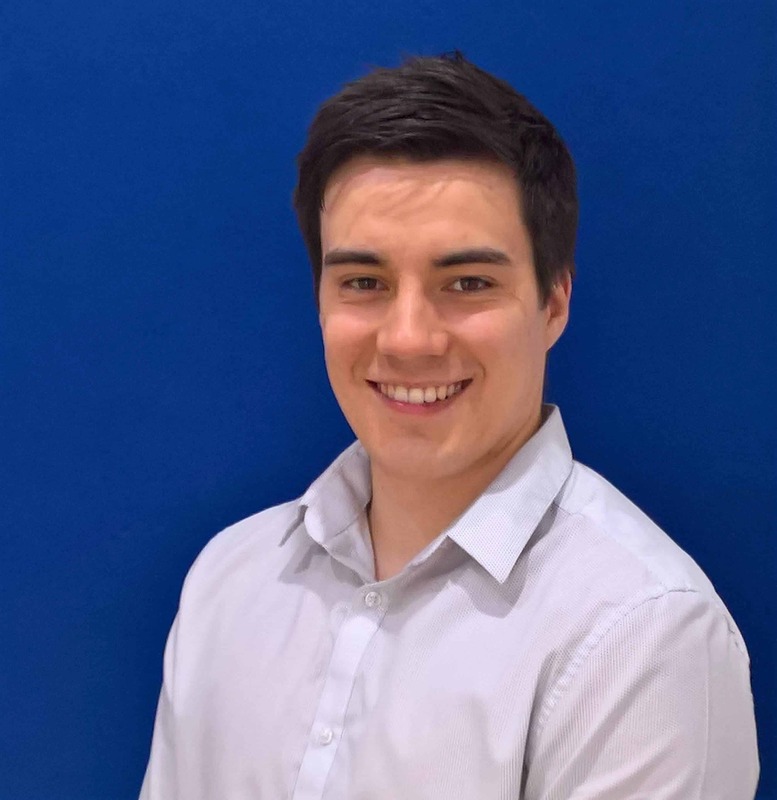 He is passionate about strength and conditioning, rehabilitation, corrective exercises, injury prevention and all things movement based.